Earlier this month a federal court in Los Angeles ordered singer Pharrell Williams and Robin Thicke to pay damages of $7.3m to Marvin Gaye’s family ruling that the ‘Blurred Lines’ song infringed on the copyright of Marvin Gaye’s ‘Got to Give it Up’. I didn’t pay much attention to the story at the time. May be it was that hat? But Pharrell’s words in in today’s Financial Times caused me to reflect on what creativity, innovation and change mean in 2015. We’re all the product of what we’ve seen, what we’ve read, where we’ve visited, what we’ve listened to, where we grew up, who we hang around with, a manager who mentored us, a teacher who didn’t believe in us. As we create things so we become part of a creative lineage. And so, the ruling appears to reflect a dated notion of creativity. There was a time when creativity was thought of as belonging to the gifted few. You either had it or you didn’t. You were creative or you weren’t. In these times creativity was associated with radically innovative ideas. The innovators like to reframe problems and offer solutions that may challenge the status quo. They like to do things differently. At the other end, adaptors like to do things better. We all hear about and remember the grand innovations that change the world. We’re less aware of, or perhaps underwhelmed by, the small adaptive improvements. This does us a disservice. It’s the incremental creativity, where many small changes build on each other, that contributes a large part to bringing innovation to life. 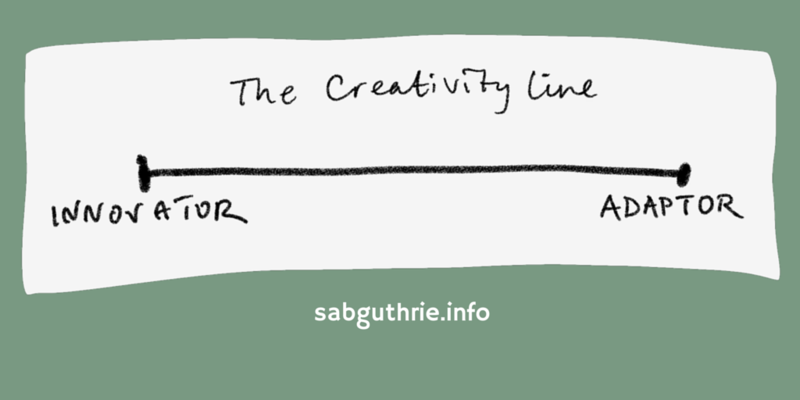 Creativity is driven by personality, mental flexibility, experience, motivation, organisational climate and context. Understanding how we think and how others around us think helps us to become better communicators. Better problem solvers. Better decision makers. It’s helpful for marketers to appreciate innovators and adaptors make different buying decisions. Adaptors tend to be first to buy ‘new and improved’ products. Innovators tend to be first in line to snap up radically new products. 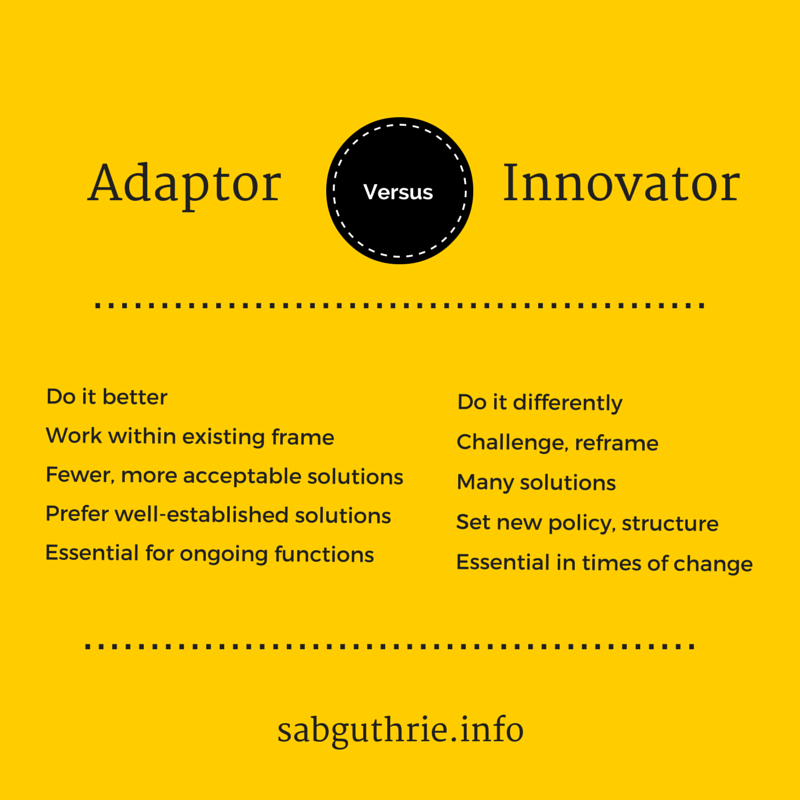 Likewise it’s helpful for communicators managing organisational change to appreciate that adaptors can be reliable, supportive and co-operative. But also resistant to change, overly cautious, and too bound up with ‘the way we do things around here’. Whilst innovators are seen as energetic, assumption challengers, but also daring and risky. Don’t muddle creativity up with imitation, though. “In the end, merely imitating your heroes is not flattering them”, writes Austin Kleon. “Transferring their work into something of your own is how you flatter them. Adding something to the world that only you can add.” Did Pharrell and Robin Thicke do enough to say ‘hand on heart’ that they had added something new? And, there’s a bigger question, or at least a different one. Not whether Pharrell borrowed from Marvin Gaye, but whether Gaye owned the thing that was borrowed in the first place. Douglas Wolk, freelance journalist and critic, suggests that Gaye may not have been immune to influence himself. Wolk points to Marvin Gaye’s 1964 single “You’re a Wonderful One” and wonders how much inspiration he got from Lonnie Mack’s 1963 version of Berry’s “Memphis, Tennessee.” Nobody’s immune to influence. Watch this space. You don’t have to be Mystic Meg to see that there’re going to be some rich lawyers getting richer as more creatives start copycat litigation.